Dad grew up in the Pacific Northwest in a little town called Pacific Beach, north of Hoquiam on the coast of Washington state. It was a lumber town and everything revolved around that industry. Because their home was just off the beach dad was in love with the ocean. He loved the sound of rumbling surf. He loved the sand, the tinge of salt in the air. And because of that, we took most of our vacations in the Bay of Bengal on the coast south of Calcutta at a place called Gopalpur. Gopalpur was a wonderful little town. There was not a single hotel in the area at that time, but the CMS (Church Missionary Society—i.e. Anglican) bungalow that we rented was about two miles from the beach, up a small hill. Evidently this was the highest point in the area because there was a lighthouse right outside the bungalow. The town was bucolic, a laid-back fishing town. The ladies all seemed to smoke hand-rolled cheroots–a musky but wonderfully aromatic tobacco. The beach was great. The water was fine. We all got sunburned badly. We ate a lot of fish. But what really made these vacations interesting was the trip. Gopalpur was simply too far to drive. The only reasonable way to get there was by train. And the train trip was basically four days. Two nights and a day by train to Calcutta. But, because of connections, we ended up spending a night there (always at the Salvation Army guesthouse) and then another night’s travel down the coast. So, three and a half days in all from Dehra to Berampur, and an hour bus ride to Gopalpur. And pretty much the same coming back. The train ride was the best part of the trip as far as we kids were concerned. As far as my parents were concerned it was a nightmare. Four days each way trying to keep track of four active boys. Four days when any one of them could end up standing on the platform of some wide spot in the tracks watching the train leave the station a cup of tea in each hand. Four days trying to get it into their thick little heads that they MUST NOT stand at the open doorway and lean out while the train was moving. “And I don’t care if everyone else is doing that. If I catch you one more time…” Four days to try to keep them clean when everything was covered in grime and soot from the steam engines. For them the several weeks on the beach was bliss, not this. I really don’t care what you think about the British and their 300 years in India. Yes, they were a colonial power. Did they impose their religion? No. Did they plunder the land? They tried but they really didn’t succeeded too well. There wasn’t much to plunder really (they did much better by collecting the poll tax initiated by the Moguls). Did they lord it over the people? Yes they did. So did every other colonial power in the history of India for the past two thousand years. Did they leave it better than they found it? I think so. India was a patchwork of small kingdoms and principalities and the British were the first foreign power to amalgamate everything on the subcontinent under central control. The previous “colonial power” the Moguls, hadn’t even come close. I am no apologist for the British, but it is much easier to malign them these days than to appreciate the order they brought to this great land. Besides roads and infrastructure, telephone and telegraphs, oversight of the forests and wildlife, peace and stability, they provided India with a magnificent rail system, a system that the Indians have improved. Today you can still leave on time and arrive on time and travel in an air-conditioned bogey just about anywhere in that great land. The rail system in India with its many feeder lines is without question the central nervous system for transportation in India. It was in the fifties and sixties as well. The apex of the steam engine era occurred during our time there. If you visit India today the train you travel by will be diesel or electric. However, if you keep your eyes open you will find that in most yards old steam engines are used to shunt cars around. The steam engine is not dead, but clearly dying. When I was a kid, they were alive and well, giant, hulking, hissing serpents and fire belching dragons. Coolies at the train station, same now as then. Up front was an enormous boiler with neat rows of rivets holding everything together. Under the long boiler was a linked pair of giant steel wheels, and a set of smaller wheels at the front. The cabs had polished brass instrumentation, a glowing inferno where coal was hand shoveled from the tender. Even at rest the engine was alive, emitting steam and sounds. You could feel the power and sense its strength just being near it, a bit frightening and yet compellingly attractive. Often the engineers would invite us to come up into the cab. You could hardly hear above the din of a moving engine and you could feel the raw power as it rumbled down the track. If we were lucky we would get to pull the string that blew the whistle. Riding in that cab was nirvana. Our train trips started from Dehra Doon, just down the mountain. 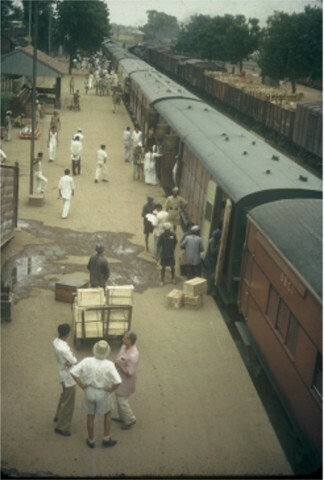 With tickets purchased the week before on the 10 Down Doon Express to Howrah, the Calcutta station, we would engage a couple of coolies for the luggage, and we four boys would lug the hand baggage. These coolies were experts. Sporting a red shirt and a brass buckle tied around their upper arms with their number on it, they almost always beat us to the bogey and had everything down waiting to get paid so they could quickly go out bring another load in for someone else. New style train but old-fashioned bister, that contained some luggage and made into something like a sleeping bag…but with sheets. There were three classes of train travel. First Class. Second Class. And our class, Third Class. 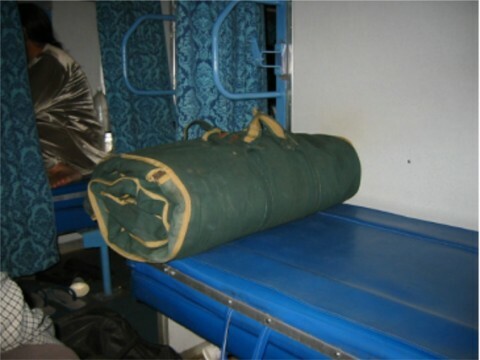 Third Class could be Third Class Hard Sleeper (which meant you had a bench to sleep on). Or it could be Third Class and just a seat. In either case there was no padding anywhere. I never recollect once traveling anything but Third Class. On either end of the bogey was a bathroom, Indian style, simply a hole in the floor (please be careful when you squat that you don‘t lose your wallet). A fairly narrow corridor ran down one side of the bogey and our compartment would be fully open to that corridor. This meant there was zero privacy. Two wooden benches faced each other. Above each of them were two more platforms that could be lowered into position at night to form a place to sleep. We would slide our footlockers under the benches, spread out the rest of our stuff, dangle our canteens from the ceiling and then ask permission to go on the platform. Well, we were supposed to ask permission. There is a whole rhythm to train travel in India. 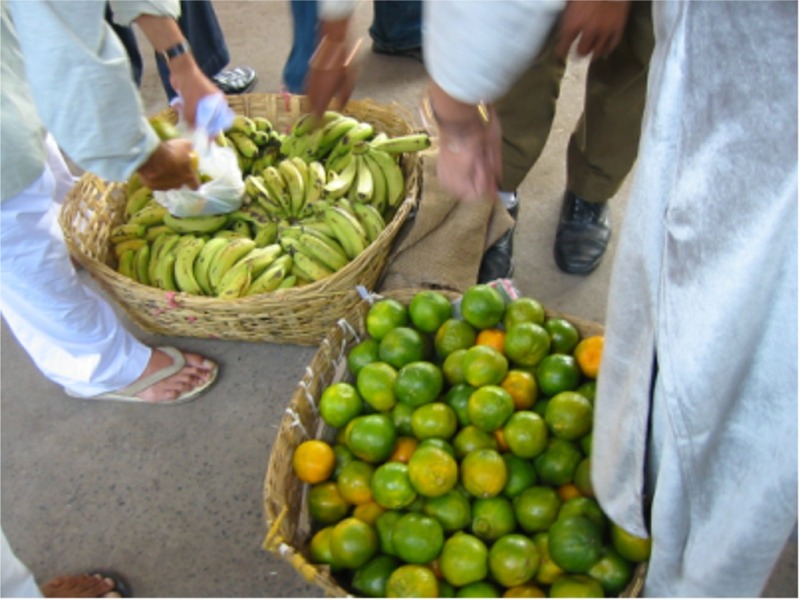 The platform bustled with passengers (invariably more than the seats on the train), coolies carrying luggage, and every manner of vendor hawking his commodity. There was food and drink of every description, from hot tea and snacks to a full meal; fresh fruit; book trolleys (we would stock up on comics and Ripley’s “Believe It Or Not”); and railway personnel in either their white or khaki uniforms. How did they ever keep them so clean? At 7PM the whistle blew. We were off! Maybe. Sometimes it was the whistle of another train. Or some dignitary had not arrived yet. Or someone had pulled the emergency chain. (“Stevie, was that you! ?”) We learned to stay away from that red handled chain that locked up the brakes for emergencies. Finally our whistle would blow. The green light was up. And the train would lurch forward. If you were on the platform this was the signal to casually note your bogey and finish your transaction. One thing the train could not do was accelerate very fast. You still had twenty seconds or so. The key here was a practiced élan. Without looking concerned, without any rush you would start to walk towards your bogey. Timing was the key. The goal was to approach the door and pull yourself in (while others were standing inside hanging outside the same door) without breaking into a run but just before the train really got moving fast. Just a hop and a skip and in you went. If, in the process, you broke into a run points were lost and you looked like a dolt. It was now dark. The lights were on. And we were chuffing our way to Calcutta and on to the beach. We would eat. Dad would read something to us for fun. And then we would have family devotions. We had family devotions every night no matter where we were. But these would be a bit more public, with people peering in to see what we were doing. Whenever we traveled we were a bit of a novelty. Then we would get our berth ready for the night. Chains would secure the sleeping platforms. And each of us would blow up an air mattress. I am not sure where we got these things but they were thick canvas, heavy as all get out and must have been WWII army surplus. It puzzled our fellow travelers until they figured out what we were huffing and puffing for. Slowly the air mattress would assume its shape. They would smile and ask where they could get one, reaching over and squeezing it. All the blowing would leave us dizzy. Somewhere in the middle of the night we would arrive at Mathura on the main line to Calcutta. Steam engines do not travel all that fast, getting up to maybe forty miles an hour on some stretches. But they also stopped at a lot of stations so the average speed was actually quite slow. At Mathura, while we were fast asleep, our train would have a bogey or two attached to it. The process was a couple pleasant bumps in the night and off we would go. The gentle swaying. The rhythmic huffing of the engine. The tikety-click, click-click, tickety-click, click-click of the rails. All of this was soothing and made sleep easy. We would travel that night, the whole next day and all the next night. It is a lot longer to Calcutta than one might think. In the mornings we would wake up at dawn. If I had been sleeping near an open window and if I were sleeping on my back, particles of soot would often collect below my eyes. One of the first things people do on waking up is rub their eyes. If I did that now, I would effectively smear that soot around my eyes and ended up looking like an anemic panda. We would point and laugh at each other. The early morning is when most folks in India go to the bathroom. However, many people in rural areas (and even cities) have no bathroom to go to. So they trundle themselves out to any suitable semi-private spot with their lotas (small brass pots to carry water) and do their business. It was not unusual in the morning to see scores of people spread out there along the tracks with their butts hanging out. In India, privacy is in the eyes of the beholder. This was no big deal, we had seen thousands of butts, maybe even millions. We hardly noticed. Effectively, daytime travel was the worst for my folks. Every hour or so we would pull into a station. We got off at every station we could. Their job was to make sure we got back on at every station. Between stations it was eat, snack, eat. Read, nap, read. Between getting food out, putting it away, getting boiled water out to drink, making sure we were reasonably clean, making sure we weren’t bothering our fellow travelers, mom had her hands full. .
During the day our third class sleeper compartment was fair game for anyone seeking floor space to sit. 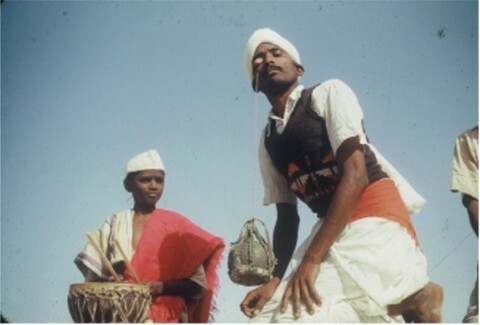 People traveling short distances would clamber on board with their luggage, tiffins (stacked containers of food for the journey), baskets and sometimes chicken and goats. Our bogey could become so crowded it was difficult to get down the corridor to the bathroom. The amazing thing in all of this was the good-natured way in which these poor folk who were sold a ticket (or perhaps had no ticket), accepted their lot in spite of no seat. The other amazing thing was their kids. They were exceedingly well behaved. Quiet. NOT running around and NOT jumping off at EVERY stop. Meanwhile we had gone through the comics. We had read through the “Believe it Or Not” books. Twice. We had played Snakes and Ladders. We had watched the passing countryside until we were sick of looking out the window (not much variety for long, long stretches). And it was not even 9 AM yet. Mom and dad groaned. It was going to be a long day. Dad was always careful when he would get off the train. He had been pick-pocketed a couple of times and did not want that to happen again. At the stations where we had time to get off there was always a bustle of activity and a cacophony of sounds–vendors hawking their wares, engines hissing, whistles blowing. And often there would be sideshow of some sort. Sometimes it would be kids doing acrobatics for spare change. Sometimes it would be a man with a couple of trained moneys. 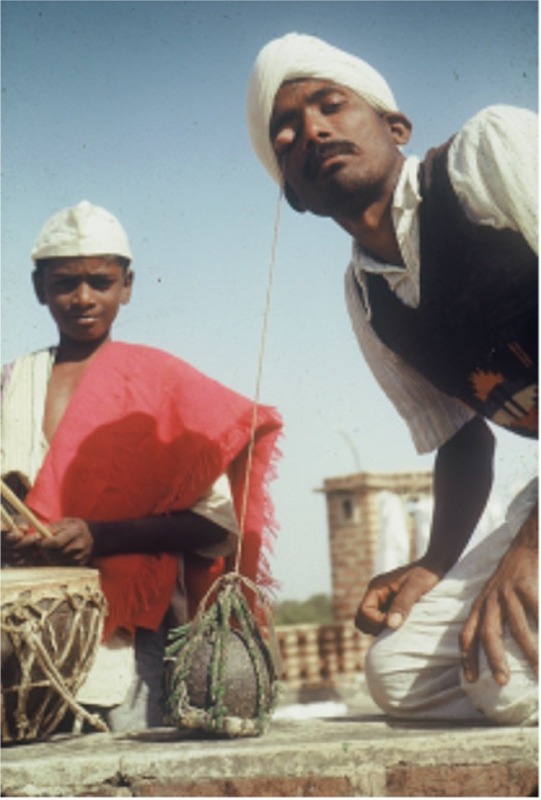 Sometimes a snake charmer–always a draw to a couple of budding herpetologists. And beggars. Lots of beggars. Our routine for the evening was the same as the night before. Eat. Blow up air mattresses. Devotions. To bed. To sleep with the seductive rhythm of the rails. 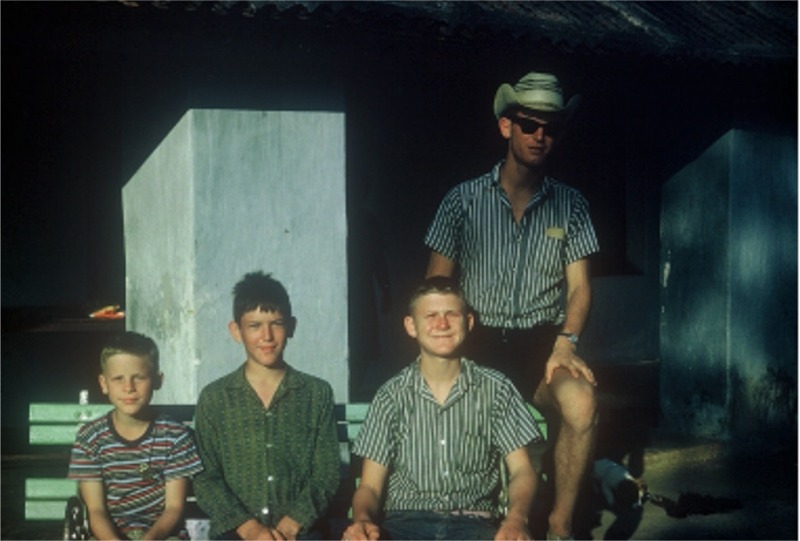 When we hit Calcutta the following morning we would bundle everything up in piles, hire a couple of coolies to haul it all out, get a taxi and go to the Salvation Army guesthouse. Calcutta is a bit of a weird place. More people live and sleep on the streets than any other large city in the world. 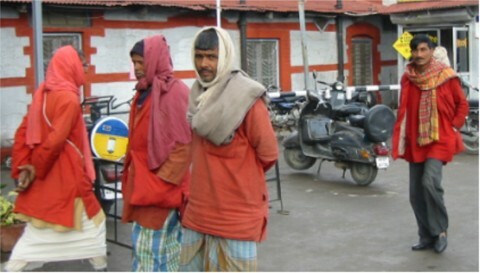 Beggars were everywhere, something we were used to–they are a fact of life in India. We spent the day at the Salvation Army guesthouse. Dad would take several of us boys up to Crawford Market by the trolley or the bus to buy some fresh fruit for the rest of the trip. This bustling market had one section where you could buy pets. Not cats and dogs, but exotic animals found up in Assam, or the jungles of Madhya Pradesh–Spotted Lingsangs, mongooses of several types, bug eyed Loris, Giant Squirrels, Hedgehogs and lots of colorful birds–it was a veritable zoo. The following afternoon we headed back to the train station and caught a night train to Behrampur, half way down the coast to Visakapatnam. In the morning we would load the luggage onto an oxcart, tell the driver where to take it in Gopalpur and catch the bus. We would get to Gopalpur in an hour, and then on to the CMS Guesthouse, which was a fifteen-minute walk from the bus stop. And the luggage would arrive seven or eight hours later. On one occasion Gordy and I elected to ride the ox cart with the luggage. We did that only once. We could have walked faster. At that point it was just beach and sun. Eat and drink. Beach and sun. Sunburn. More sunburn. Blisters because of sunburn. Eat fresh fish and prawns. And every evening dad would read us stories. And we would have devotions. And we would head to bed. And then, a couple of weeks later, back to the train station in Behrampur for the trip back. On the morning of the fourth day we would pull past Hardwar into the Doon valley. We would feel the crisp air, and see our beloved hills in the purple haze of first light. We were home. Past Dohiwala. Past Lachuwala. And into the station at Dehra Doon. Home. Home again. The vacations were fun. Getting there and back was not half the fun. It was almost ALL the fun.